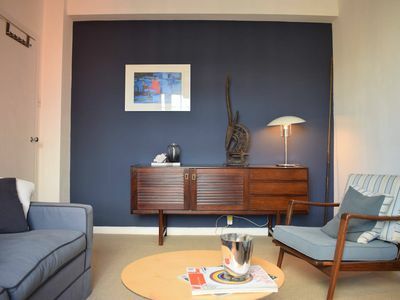 The flat is in a charming 1930's building with an original layout and in a magnificent part of London. In an enviable part of London, with landmarks such as the Museums, Hyde Park, and London Eye all within easy reach, you couldn't wish for a better location from which to explore London! My delightful flat is in a beautiful 1930's building, and has been maintained and decorated to a beautiful standard. The main living space is stylishly decorated, with comfortable seating in front of the TV. The kitchen next door is small but practical, with everything you'd need to whip up a meal during your stay. On the other side of the flat is the large bedroom, with king size bed on which my cleaners place fresh, hotel-quality linen before your arrival. The bathroom next door has a shower over the bath. I hope you enjoy your stay here!